It was a faint sound, like some electronic device in the next room — just enough to awaken me. It turned out to be a tsunami warning siren that was a considerable distance from where we were, and in that pre-dawn hour, it seemed to be nothing more than an annoyance. I went back to sleep. Not long thereafter, Sally’s cell phone rang, waking me up again. It was our daughter, calling from several thousand miles away to let us know that a tsunami was bearing down on us. The devastating 8.8 magnitude earthquake that rocked Chile, she said, had triggered giant waves that were expected to reach Hawaii within a few hours. That news got our attention. We were staying with friends in their private residence and by now they were stirring, too — packing, in fact. The Hawaiian authorities had announced that everyone in coastal areas had to evacuate by 9:00 a.m. Since we were visitors, we didn’t have to think about what to take with us. We had both come to the island with one suitcase each, so that’s what we’d leave with. For residents, it’s more of a dilemma: what is essential? Some things have to be left behind and potentially lost, but what do you absolutely need? And for that matter, where do you go? I can answer that last question. On Saturday, February 27, 2010, everyone on the Big Island of Hawaii evacuated to gas stations. Lines were around the block at the few stations that remained open. None of us knew how long we’d be stranded, of course, so it seemed prudent to gas up. Guests of the hotels along the Kohala Coast were shuttled to higher ground; when they had planned their vacations, none of them imagined that they would be spending part of it in a community recreation center, eating sandwiches prepared by relief workers. Our hosts hastily made arrangements for our evacuation to a rental property, a farm house far from the coast. It had a television, so our group was able to watch the local news coverage. TV cameras were aimed at various beaches and bays; reporters and experts speculated about the degree of devastation we could expect, and counted down the minutes until it arrived. The tsunami eventually did hit the islands, but with considerably less force than had been anticipated. On the Big Island, the wall of water (if you want to call it that) was only three feet high. This seemed to be disappointing to some of the newscasters who were prepared, even eager, to describe scenes of destruction. Personally, I was relieved that we weren’t stuck without power and water; I didn’t mind one bit when the authorities rescinded the mandatory evacuation order after a few hours. Scientists may have miscalculated, or maybe government officials erred on the side of caution, but the important thing is that there were very few people who actually suffered. That would be the vendors who were trying to sell “I Survived the Tsunami” T-shirts. This entry was posted in Travel and tagged tsunami. Bookmark the permalink. Thanks for the heads-up that morning, Jen. 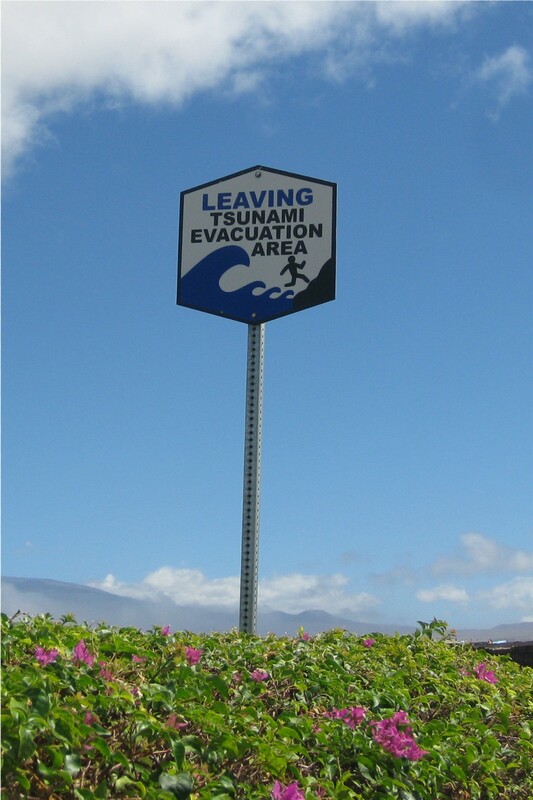 Maybe a few tips on tsunami survival would be worth including in the next edition of your book, Adventure Guide to the Big Island. It was certainly an adventure! You guys are in Hawaii? There was an earthquake in Chile?